All transactions are safe and secure with a reliable history in online purchasing behind each of our associates. Buy the White Lion Hangover 2 t-shirt to own Hangover 2 clothing and merchandise. After Phil, Stu and Alan discover that the "Teddy" who turned up at the police station is an elderly Buddhist monk and not the 16-year-old Teddy they are looking for, they eventually head to the White Lion night club where they question the owner and a dancer, the latter of whom sheds some embarrassing light on the previous night's events, at least with regard to Stu. Next to the White Lion bar is Lou's Tattoo Parlor, where they see footage of the riot and destruction they caused. This White Lion shirt features the logo for the bar / night club. 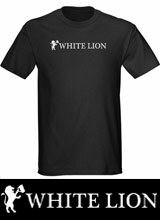 In addition to the White Lion Hangover 2 tee above, browse the Hangover 2 Clothing Gallery for more apparel like men's and women's clothes, kids shirts or hoodies.